The market for PCVs is huge, there is enough room for at least five entities, said Pushpa Vijayaraghavan, vice-president of consulting firm Sathguru Inc. In India, there are 25 million babies born every year. Even by the most conservative of pricing estimates, it’s a $500 million market, she explained. It’s just matter of time before India introduces PCVs into its immunization programme, as it is already a GAVI-eligible country, Vijayaraghavan added. Mosuvan Kuppusamy and his team of a dozen people, including molecular biologists and biochemists, are working in mission mode at Alexandria Knowledge Park on the outskirts of Hyderabad to get their pneumococcal conjugate vaccine (PCV) candidate into clinical trials, where the vaccine will be tested on humans for safety and efficacy. Their goal is to get the drug candidate into the trial stage in two months. After close to five-and-a-half years of toil and burning through Rs.6 crore, the 60-year-old scientist-turned-entrepreneur’s Tergene Biotech Pvt. Ltd has been able to develop a potent vaccine candidate that provides protection against 15 bacterial sub-types of pneumonia, a disease that infects the lungs. The fledgling company that survived on Biotechnology Industry Research Assistance Council (Birac) funds and Kuppusamy’s family silver, got a booster shot last year when Aurobindo Pharma Ltd, one of India’s leading generic drug makers, decided to invest in it. Birac, under the department of biotechnology of the ministry of science and technology, has the mandate to strengthen and empower research capacities of biotech entrepreneurs and provide an enabling ecosystem. Aurobindo Pharma will fund the remainder of the vaccine development process that includes clinical trials, setting up a production plant and marketing the vaccine—all of which may cost upwards of Rs.120 crore. “There is a huge unmet need for a pneumococcal vaccine and our vaccine is comprehensive and cost-effective,” Kuppusamy said. If everything goes according to plan, Kuppusamy is confident that PCV will hit the market by 2018-end. Tergene is not alone in the race to make the pediatric vaccine. Big Indian vaccine names such as Pune-based Serum Institute of India Ltd and New Delhi-based Panacea Biotec Ltd are also developing PCVs. Serum and Panacea have received funding support from the Bill and Melinda Gates Foundation. Serum Institute’s PCV has entered phase-2 trials, and is expected to take at least two years to hit the market. It is collaborating with global non-profit healthcare agency PATH for the speedy development of a 10-valent PCV, focusing on the serotypes or bacteria sub-types prevalent in 70.4% of the affected population in Asia, Africa, Latin America, and India, the Serum website said. “If phase-3 trials are positive, it’s a game-changer vaccine,” said Suresh Jadhav, executive director of Serum. Panacea Biotec’s 10-valent PCV has entered phase-2 and phase-3 studies simultaneously. “So far, the clinical outcome is very promising,” said an executive of Panacea, who didn’t want to be named. The executive declined to share more details. Rajesh Jain, managing director of Panacea Biotec, couldn’t be reached for a comment. Panacea Biotec has ramped up its production capacity to supply 4 million doses of PCV in anticipation of the vaccine’s rollout and has been trying to get a partner to fund phase-3 trials, said an expert who closely tracks the vaccine industry and didn’t want to be named, citing his company’s policy. The Panacea vaccine could be the first to hit the market, the expert said. To be sure, Indian companies are pitted against formidable rivals in the form of US-based Pfizer Inc. and UK-based GlaxoSmithKline Plc. (GSK), which already have pneumococcal vaccines in the market. Pfizer’s PCVs Prevnar7 and Prevnar13 are blockbusters, with sales of $4.5 billion globally in the year ended December 2014, while GSK’s Synflorix posted sales of £398 million ($620 million). Pfizer’s Prevnar13 is the most widely prescribed vaccine by paediatricians and provides protection against 13 types of bacteria causing pneumonia, while GSK’s Synflorix provides protection against 10 types of bacteria. Not to be left out, US-based Merck and Co. and France-based Sanofi SA have also joined the race to develop new PCVs, which are in various stages of clinical development. Why the rush for a pneumonia vaccine? According to a study funded by the Bill and Melinda Gates Foundation, published in medical journal Lancet in October 2014, of the 6.3 million children who died in their first five years of life in 2013, 51.8% (3.26 million) died of infections. Pneumonia caused close to a million deaths, or 15% of the total. The three leading causes of under-5 deaths in India are pre-term birth complications, pneumonia and intrapartum complications. Pneumonia and diarrhoea accounted for 297,114 deaths in India. “Most of the deaths related to pneumonia are preventable,” said P. Sudarshan Reddy, senior paediatrician and researcher. Reddy heads Hyderabad’s Niloufer Hospital, which is one of the largest publicly-funded maternity and paediatrics hospitals in India. Pfizer’s Prevnar13 costs about Rs.3,800 per dose, while GSK’s Synflorix is priced at around Rs.2,000-2,200. In addition to the administering cost by the physician, a child needs at least three primary doses to get protection against pneumonia—taking the cost of the vaccine to Rs.11,400 and Rs.6,000-6,600, respectively, making it the costliest vaccine in the immunization schedule of a child. Some pediatricians suggest an additional PCV booster as well. India is yet to introduce PCV as part of its universal immunization programme. Globally, pneumococcal vaccines have been introduced in 117 countries and 58 of those countries are eligible for GAVI funding. GAVI, or the Global Alliance for Vaccines and Immunisation, has raised $1.5 billion from donors as advance market commitment funds to supply PCVs. The alliance procured a total of 100 million doses of PCV in 2014 and has contracted the supply of 1.46 billion doses, till 2024. Pfizer and GSK have been allocated $1.095 billion of the funds. Pfizer and GSK charge GAVI $10 per child for three doses. On top of this price paid to the companies, for a certain percentage of the doses sold to GAVI, they get an additional top-up subsidy on the base price, which makes it $7 per dose (or $21 per child). Pfizer and GSK are under pressure from advocacy groups such as Médecins Sans Frontières (MSF) to reduce prices of PCVs. “The high price of the PCV means that governments aren’t able to afford its introduction in their public immunization programme, and therefore children aren’t being protected against pneumonia,” said Kate Elder, vaccines policy adviser at MSF. “Just as a comparison, the pneumonia vaccine at its lowest global price (GAVI price) is currently 70% more expensive than the measles vaccine (also bought by GAVI),” Elder said. MSF has started a campaign urging Pfizer and GSK to lower the price of PCVs to $5 per child. “Pfizer and GSK, the only two companies producing the PCV, have made more than $30 billion so far on sales of these vaccines. We think that it’s safe to say that they can afford to drop the price,” MSF said. Both Serum and Panacea have made commitments to supply PCVs to GAVI. Serum has pledged to sell the product at $6 per child ($2 per dose) to GAVI, and says that it will still make a profit. There is no information available publicly regarding Panacea’s pricing commitment. Analysts say even discounting the lucrative private market, where Indian vaccine companies aren’t too strong, there is still a lot of money to be made on sale of PCVs to mass immunization programmes. But there are technical and financial viability challenges to development of PCVs. “PCV clinical trial is a very tricky thing,” said Jadhav of Serum Institute. “You have to do it (clinical trials) in adults first, followed by toddlers, and then infants, unlike other vaccines where you can directly go to infants. As there are 10 different serotypes, you have to check for each serotype…whether it’s working,” Jadhav said, explaining the complexity of the vaccine. 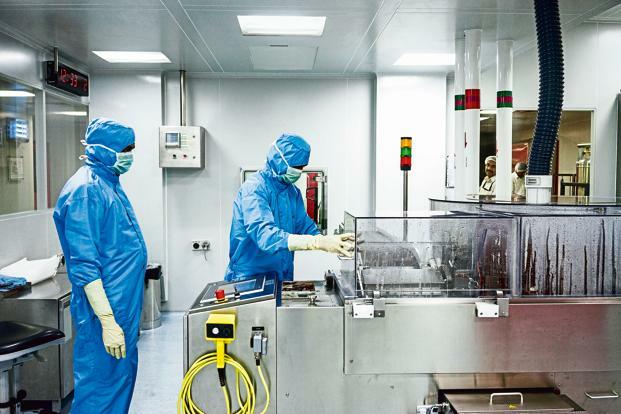 “It’s a very complex vaccine to manufacture,” said K. Anand Kumar, deputy managing director at Hyderabad-based Indian Immunologicals Ltd, which makes animal and human vaccines. “When you say pentavalent, it’s just 5 serotypes, whereas this is a 10-15 valent vaccine that means 10-15 different serotypes of pneumococci have to be grown, purified and made into a vaccine, so stability of the vaccine is a major factor,” Kumar pointed out. Krishna Ella, chairman of vaccine maker Bharat Biotech International Ltd, takes a cautious line on PCV. “Pfizer and GSK have already brought down the prices to $3.30-3.5 per dose for GAVI. There is scope for further price erosion,” said Ella. Hyderabad-based Bharat Biotech, which successfully developed a vaccine against childhood diarrhoea and offered it at $1 per dose, has stayed away from PCV so far.